A row of “estate” endorsed t-shirts in a Deb store in New Jersey. Photo by Jennifer Jean Miller. There is a misconception that I need to clear up, as an author, someone who represents one of Marilyn’s second cousins’ publicity, as a distant cousin of Marilyn’s myself, and as someone very versed on the subject of Marilyn Monroe since childhood…and especially on the topic of her right of publicity. There’s a false impression that Marilyn Monroe is “owned” and “run” by an estate. And those who run it are relatives. This is a charade that has gone on for many years, laced with mistruths. There is a group that has been referring to itself as the “Estate of Marilyn Monroe,” though it has technically never had the right to own her. And it is not run by Marilyn’s family. 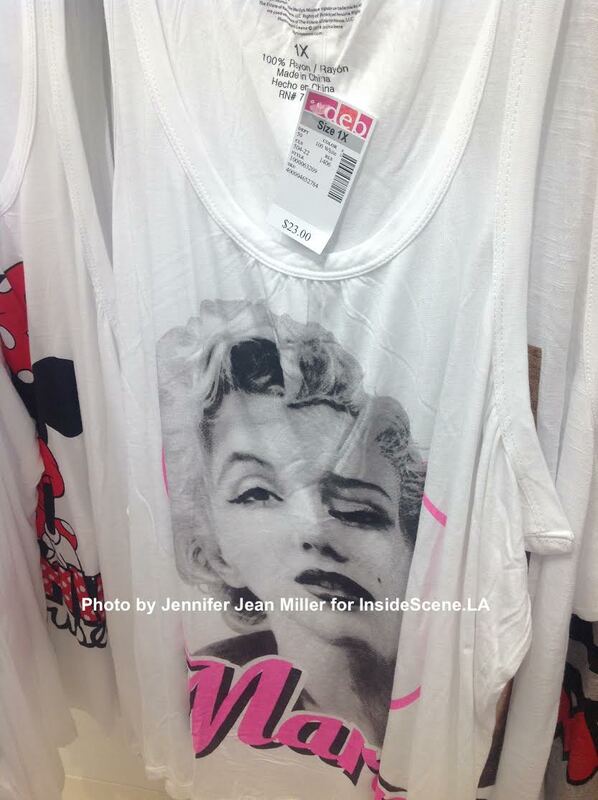 A t-shirt of Marilyn, where her eye is strangely distorted. Photo by Jennifer Jean Miller. When Marilyn Monroe died in 1962, a will was in effect from 1961, that named Lee Strasberg, her acting guru, as the residuary beneficiary of her estate. He received her “personal effects” and whatever remaining balance of the estate was left. Another beneficiary was Marilyn’s psychiatrist, Dr. Marianne Kris. This will is questionable to begin with anyway, because it was obtained under undue influence. Less than a month after Marilyn signed this document, she was placed in solitary confinement in the Payne Whitney Psychiatric Clinic, under false pretenses, by Dr. Kris…Joe DiMaggio was the only one who pursued Marilyn’s release, and threatened to tear the hospital down “brick by brick” to get to her. Marilyn complained to her half-sister before her death she was coerced to sign this…this will troubled her…she had expressed to Joe DiMaggio in a telegram in the latter part of 1961 that she wanted to change her will and include him on it. On August 6, 1962, there were plans for Marilyn to do just that…change her will…and she planned to marry Joe DiMaggio two days later on August 8. However, on the late evening of August 4, 1962, she was murdered…which has been covered up as a suicide or a hit from the mob or the Kennedy brothers…and her doctor who was manipulating her, Dr. Ralph Greenson, who was a beard for Freudianism, along with Marilyn’s beneficiary on the 1961 will, Dr. Marianne Kris, went to his grave never arrested, tried, or convicted for her murder. 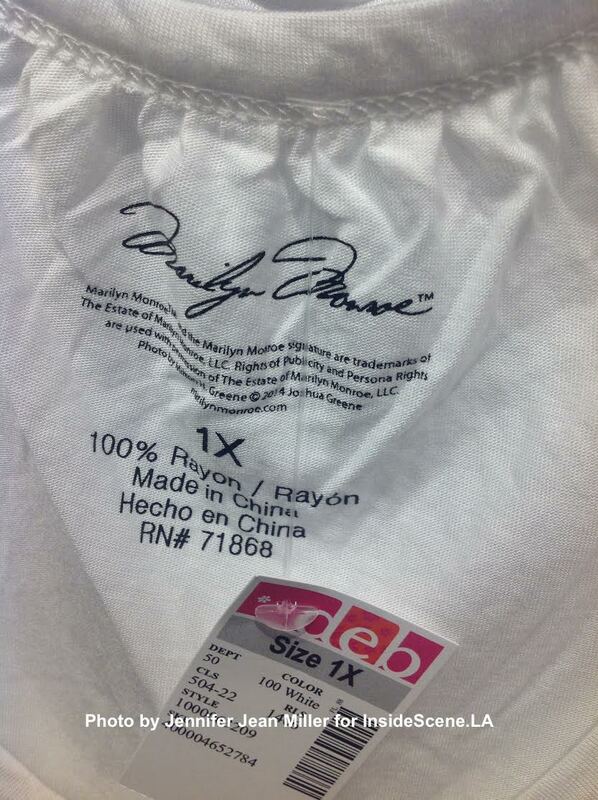 An “estate” trademark, emblazoned onto a t-shirt. Photo by Jennifer Jean Miller. When Dr. Marianne Kris died, her trust from Marilyn’s will was willed to the Anna Freud Centre…an organization that both she and Dr. Greenson actively sought funds for. They had been shopping for millionaires for funding, and in Anna Freud’s biography, it was noted how “timely” Marilyn’s death was, as the organization received funding. Yet, what the Anna Freud Centre receives is blood money, as does the “estate” of Marilyn Monroe, which markets t-shirts, jewelry, and the like, exerting control over her likeness, when there is no legal right to. Though she is now a minority partner in the venture of marketing Marilyn, Anna Strasberg, a woman who never knew Marilyn and the widow of Marilyn’s acting guru Lee, went straight to work hawking Marilyn’s image after his death in 1982. Plates, dolls, key chains, mugs, tree ornaments, and other tchotchkes, were among the offerings she began creating. 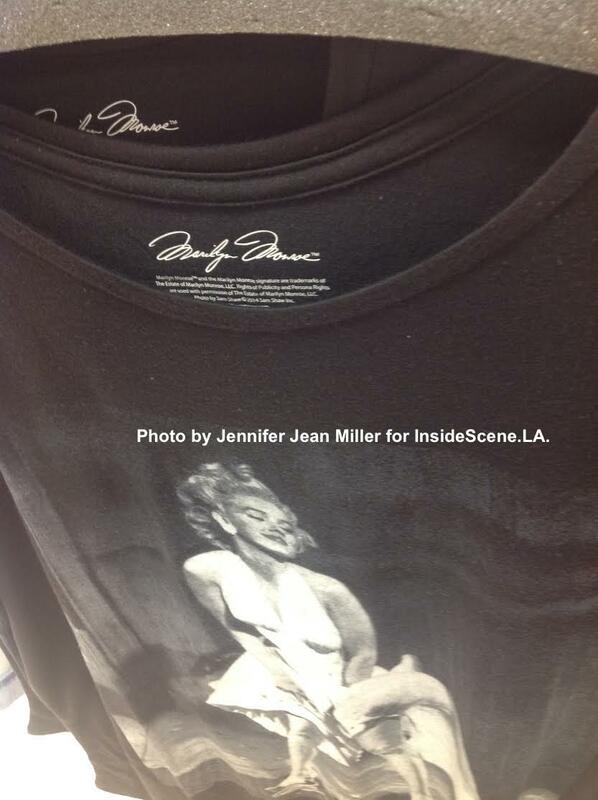 No one else was allowed to sell anything with Marilyn’s face or name on it, unless it crossed Anna’s desk. If they circumvented her, and did not pay the licensing fees for the use of Marilyn’s image, there was hell to pay in the form of aggressive court proceedings. Legal wranglings ensued, after Anna went head to head with photographers whose fathers photographed Marilyn…the children of Milton Greene, Sam Shaw, and Tom Kelley…after she attempted to exert holds over the photographers for creating their own products with their fathers’ images without her consent. In 2005, she sued all of them, claiming right of publicity. Click here to read a 2006 article on the topic. In May 2007, Anna Strasberg lost in court, when Judge Colleen McMahon of the United States District Court in New York said that she did not own Marilyn’s right of publicity. The photographers were permitted to market their own images, as the owners, without Anna’s interference. The judge ruled that Marilyn’s right died with her in 1962, as she did not will the right to anyone on her will, nor did the rights exist at the time of her death. In 1994, the Indiana Right of Publicity Act was created, extended post-mortem publicity rights for 100 years following a decedent’s passing. Of course, this law was created over 32 years post-mortem, and could not be applied to the case of Marilyn Monroe. That did not stop Anna Strasberg. She did not skip a beat and pursued it through legislative channels. She grabbed the ears of Senators in California, feeding them lies and lobbying for change, to ensure residuary benefits. She succeeded in California, but was not able to push through New York. Though Anna was defeated in New York, she rerouted her efforts, by teaming up with Authentic Brands Groups (ABG), which believes it can exert control over Marilyn’s name, lips, and eyes. 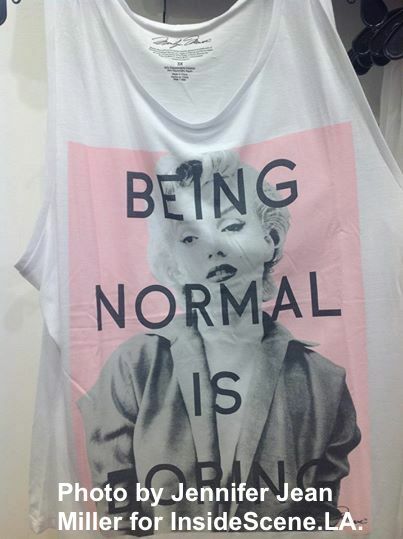 Another variation of one of the misquotes is on the shirts below, sold in one of the Deb Shops in New Jersey. Marilyn Monroe misquoted on an estate t-shirt. Photo by Jennifer Jean Miller. Another Marilyn Monroe Fake Quote, this time, with glasses and gum photoshopped onto her face.Photo by Jennifer Jean Miller. 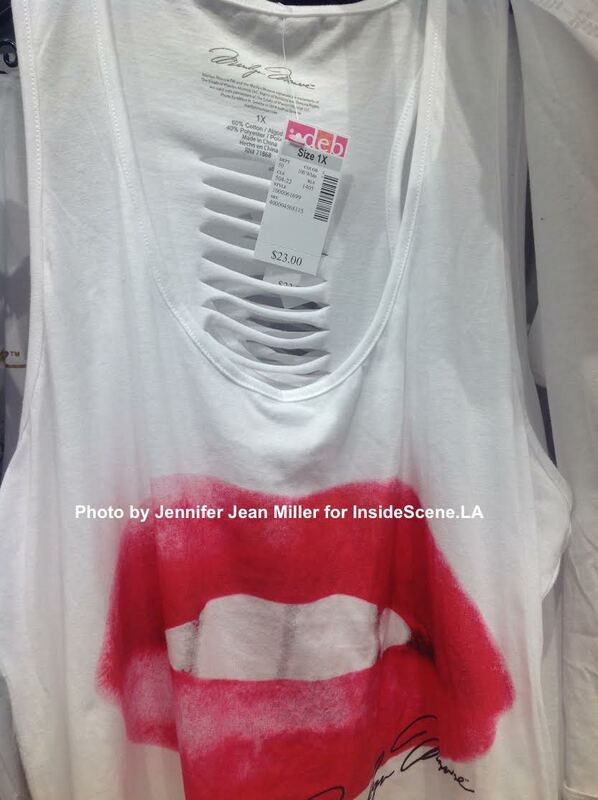 And then there is a shirt, which is said to be Marilyn’s lips themselves. Even Joshua Greene, who now manages his father’s estate, is coining up on this one, as they claim these are a pair of lips that his father took pictures of. 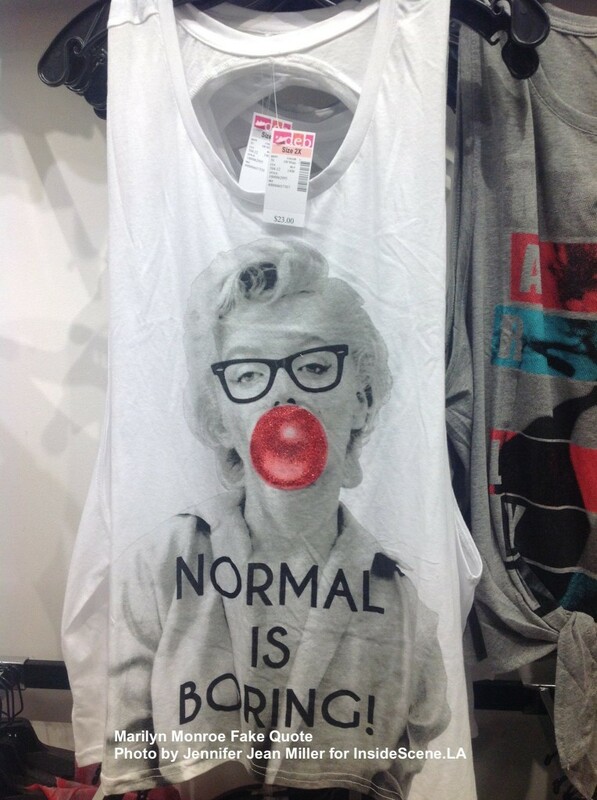 A rendition of Marilyn’s lips, adapted onto an “estate” t-shirt, said to be from a Milton Greene photograph. Photo by Jennifer Jean Miller. Yes, that’s right…after Anna Strasberg sued the photographer children, after millions were dumped in legal fees, now two of them are prominent licensees with ABG…Joshua Greene and the heirs of Sam Shaw, since have licensed their images with the group of which the plaintiff against them, Anna Strasberg, is now a minority partner in. An “estate” t-shirt with one of Sam Shaw’s photos emblazoned onto it. Photo by Jennifer Jean Miller. Interestingly enough, in 2011, Joshua Greene, who manages the Milton H. Greene Archives, filed suit against Anna Strasberg and the company she used to manage the “estate,” Marilyn Monroe LLC, and CMG Worldwide Inc., the company she used to license Marilyn. His case was heard in California. Anna Strasberg, as she was in 2007, was judicially estopped, for changing Marilyn’s domiciliary to suit her needs. She would vacillate between California and New York, where Marilyn held residences in both locations. Though Marilyn technically died in her California home, she did so as a New York resident…and had filed her last income taxes in New York as a resident, in 1962. Marilyn planned to keep her California home as a place to stay when she was making a motion picture. She preferred the privacy of a residence to a hotel. The court once again told Anna Strasberg that she does not own Marilyn’s right of publicity. Yet, somehow she and now ABG, continue to lay claim that they own Marilyn’s name, her eyes, and even her lips. 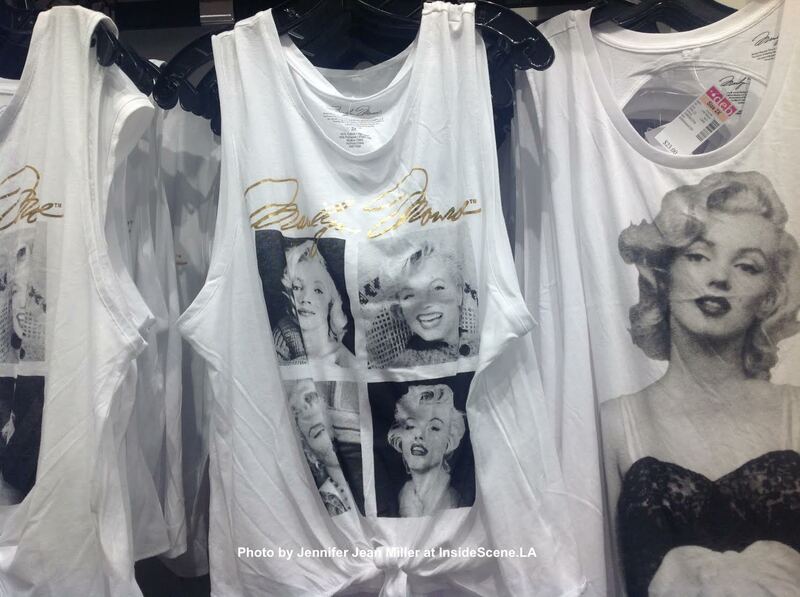 They crank out product after product, with Marilyn’s image on them, as can be seen as with some of the examples below. One small story, that Anna Strasberg released herself, was something that Marilyn’s cousin Jason Kennedy, refers to as the “Surgeon Story.” I have written about the “Surgeon Story,” and this topic, in my book, Marilyn Monroe & Joe DiMaggio – Love In Japan, Korea & Beyond. Jason is currently working on his own book that focuses specifically on the “Surgeon Story,” which I will be editing soon. The “Surgeon Story,” was written in Marilyn’s own words, chronicling the emotional abuse that she endured under Lee Strasberg and Dr. Margaret Hohenberg, then her therapist. She wrote this in 1955, seven years before her untimely death. And then in 1956, there was Marilyn Monroe’s first will, which Lee Strasberg was already a beneficiary…though he only knew Marilyn for about a year. So was Dr. Hohenberg. Many have written off the “Surgeon Story” as a dream…though it was the start of Marilyn’s living nightmare commencing, where she became a victim of coercive extortion from several parties, who she mentions…it discusses the emotional abuse that she has suffered, how she was drugged during an emotional “surgery” to extort monies from her. 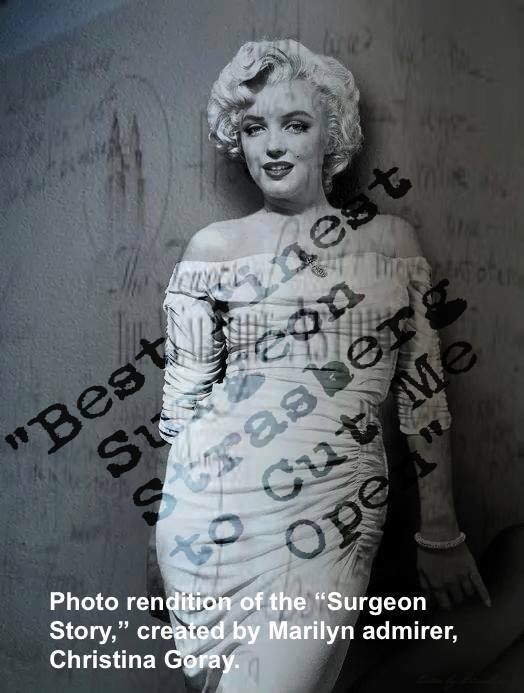 A photographic and artistic creation of the “Surgeon Story,” by Marilyn admirer Christina Goray. She named names that were involved in her “surgery.” Lee Strasberg, Arthur Miller, Milton Greene, Dr. Margaret Hohenberg, and Norman and Hedda Rosten…all of these characters, except Milton Greene, her then business partner, were on her 1956 will (though Greene’s residence was what was listed as Marilyn’s home address, though she no longer resided there in 1956. Arthur Miller was not even officially divorced from his previous wife, yet had Marilyn died in 1956, he would have been slated to inherit $100,000 of Marilyn’s money. You can learn more about the “Surgeon Story,” spelled out in this video. Please remember Marilyn’s chilling words that chronicle the emotional abuse and dissociative psychiatric drugs she was given, and that she was murdered by people who benefitted off of her questionable will and legacy, when you purchase anything that is “estate” endorsed with her name on it. Like this story? 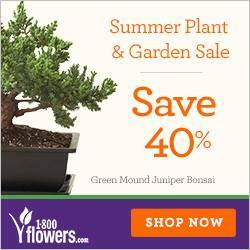 Click here to follow us on Facebook!